Over the last few years, there have been more and more stories in the news about hospitals asking patients to pay their deductibles before medical services are provided. Why is this happening, and what do consumers need to know in order to navigate our current health care system? In the past, it was generally accepted that patients were expected to pay their copays at the time of service, but charges that counted towards the deductible would be billed after the fact. So if your health plan had a $20 copay for an office visit, the doctor's office would collect that when you arrived for the appointment. But if your plan had a $2,000 deductible and you were going in for surgery, you'd pay nothing at the time of the surgery, but would get a bill from the hospital a few weeks later. First, they would send the claim to your insurer, where the negotiated rate would be calculated and amounts over that would be written off. Then the insurer would pay their portion, and notify the hospital about the patient's portion of the bill. At that point, the hospital would send you a bill for your deductible and any applicable coinsurance. Why Are Patients Increasingly Being Billed Upfront? You may still find that your hospital uses the traditional method of waiting to send you a bill until after your procedure is complete and your insurance company has processed your bill. But it's increasingly common for hospitals to ask for payment—partial or in full—of your deductible before scheduled medical services. This is due to a variety of factors, including increasing medical costs and increasing deductibles and total out-of-pocket costs. But in general, the idea is that hospitals don't want to be stuck with unpaid bills. They know that after the procedure is completed, patients may or may not pay the portion of the costs they owe. The hospital can send patients to collections, but obtaining payment upfront is a more effective method of ensuring that the bill gets paid. What Should I Do If the Hospital Asks for Payment Upfront? Ideally, this is something you'll want to discuss with the hospital billing office well in advance of your procedure. Finding out 18 hours before your surgery that the hospital wants you to pay your $4,000 deductible immediately is a stressful situation, to say the least. If you're scheduling a medical procedure where your deductible will apply, inquire about the hospital's policies right from the start. Talk with your insurer to see if they have any contract negotiations with the hospital that require the bill to be sent to the insurer before the patient is charged. If not, the hospital may very well want you to pay at least a portion of the deductible upfront. If in doubt, it's also wise to contact your state's insurance department to see if they have any advice about rules and regulations in the state that pertain to medical billing practices. The more you know, the better you'll be able to navigate the system. How Much Will You Actually Owe? Ask the hospital to provide you with an estimate of what you'll owe, keeping in mind that negotiated medical costs are far lower than retail costs. For example, let's say your deductible is $5,000, you're scheduling an MRI, and you haven't yet paid anything towards your deductible for the year. The average cost of an MRI is more than $2,600, although it varies considerably from one hospital to another. And whatever amount the hospital charges is likely to be quite a bit higher than the negotiated rate that your insurer has with that hospital. The hospital might bill $2,000, but the insurer's negotiated rate might be $1,295, for example. In that case, the amount you would have to pay towards your deductible would be $1,295, not $2,000. This isn't really an issue if you're having a procedure that's many times more costly than your deductible. If you're about to have a knee replacement, which averages nearly $50,000, and your deductible is $5,000, you're going to have to pay the full deductible. The hospital might ask you to pay all or part of it upfront, or they might bill you after they submit the claim to your insurer, but there's no getting around the fact that you're going to have to pay the full $5,000. In the previous example about the MRI, however, the actual amount you'll have to pay isn't certain until your insurer has processed the claim. If the hospital is asking you to pay a portion of your deductible in advance and it's unclear as to how much you'll actually owe, be sure you discuss the situation with your insurer before giving any money to the hospital. One way or another, you'll want to make sure that you're only paying the amount that your insurer's EOB ultimately says you owe, rather than the amount that the hospital charges. Hospitals are increasingly working with banks to establish payment plans for patients who need them, often with no interest and with availability that doesn't depend on the patient's credit history. If the hospital asks you to pay your deductible in advance of a medical procedure and there's no realistic way you can do so, ask them about the possibility of a payment plan. The hospital wants you to get the care you need and get well, but they also don't want to be stuck with bad debt if you're unable to pay your portion of the bill. A payment plan that lets patients stretch out their bill over several months or even years is preferable to the patient going without care or the hospital not getting paid at all. If you can't pay the amount that they're asking for, suggest an amount that you can pay, and ask if they'll let you schedule payments for the rest. Ask if there's a case manager or social worker at the hospital who can assist patients in navigating the billing and payment process. You don't have to figure this out alone, and it may turn out that the hospital's payment requirements could be more flexible than they first appear. Depending on your financial situation, you should also ask about the hospital's charity care program, or whether they can write off a portion of your costs based on your income. Can Hospitals Deny Care Based on Ability to Pay? There's sometimes a misconception about hospitals' obligations in terms of providing care regardless of a patient's ability to pay. Since 1986, the Emergency Medical Treatment and Labor Act (EMTALA) has required all hospitals that accept Medicare (which is virtually all hospitals in the U.S) to provide screening and stabilization services to any patients who arrive in the emergency room, including women in active labor, regardless of the patient's insurance status or ability to pay for care. The emergency room is required to screen all patients to determine what the problem is, and to provide stabilization services—they can't let a patient bleed to death on the floor because of a lack of funds. But they don't have to provide anything beyond stabilization if they're not certain that the patient will be able to pay for it, and EMTALA doesn't extend to any care beyond emergency services. So a pre-scheduled medical procedure is not going to be subject to any rules that require hospitals to provide care regardless of the patient's ability to pay. The uninsured rate is lower than it was when the Affordable Care Act was implemented, although it has increased under the Trump Administration. According to U.S. Census data, 14.5 percent of the U.S. population was uninsured in 2013. That had fallen to 8.6 percent by 2016, but grew slightly, to 8.7 percent, in 2017. And although Census data for 2018 is not yet available, other data indicate that the uninsured rate climbed again in 2018—but it is still well below the pre-ACA uninsured rate. While that is undoubtedly a good thing, some of those newly-insured people have particularly high out-of-pocket costs. The ACA limits how high in-network out-of-pocket costs can be, but the limit itself is fairly high. In 2019, health plans can have out-of-pocket costs as high as $7,900 for an individual and $15,800 for a family. And for 2020, HHS has proposed increasing those upper caps to $8,200 and $16,400, respectively. Many health plans have out-of-pocket limits well below those amounts, but deductibles on individual market plans are often multiple thousands of dollars (cost-sharing reductions lower these deductibles for people who are eligible for them, as long as they select a silver plan in the exchange). Employer-sponsored plans have to abide by the ACA's cap on out-of-pocket costs too, but they tend to have deductibles and out-of-pocket costs that are lower than those in the individual market. In 2018, the average deductible for people with employer-sponsored health insurance was $1,350, but that included the lucky 15 percent of covered workers who didn't have a deductible at all. When we only consider the 81 percent of covered workers who did have deductibles, their average deductible was more than $1,500. Yet the Federal Reserve reported in 2017 that 44 percent of respondents to their Survey of Household Economics and Decision Making would not be able to come up with $400 to cover an unexpected bill, or would have to sell something in order to cover the cost. That presents a conundrum when people have an unexpected but necessary medical procedure and a fairly high deductible. It also presents a conundrum for hospitals—tasked on one hand with providing health care to local residents, but also needing to generate enough revenue to stay financially viable. 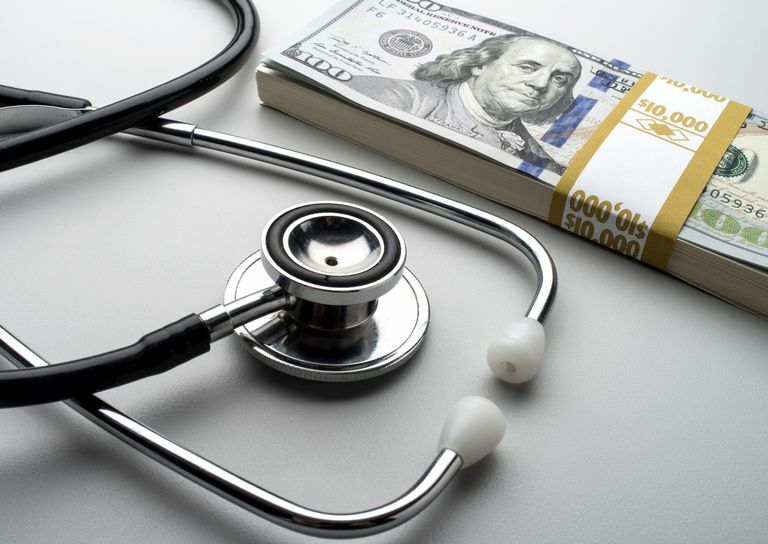 Requiring upfront payment of at least part of the deductible is one way for hospitals to avoid situations in which patients end up unable to pay their bills. If your employer offers an HSA-qualified high deductible health plan (HDHP), or if you're purchasing your own health insurance in the individual market, consider enrolling in an HDHP. They aren't the right fit for everyone, but if you're covered by an HDHP, you can contribute pre-tax money to an HSA, and it will be there if and when you need it. In 2019, you can contribute up to $7,000 to an HSA if you have family coverage under an HDHP, and up to $3,500 if you have self-only coverage under an HDHP. Even if you can only contribute a small amount each month, it will add up over time, and there's no "use it or lose it" provision—the money remains in your account until if and when you need to withdraw it. You can build up a cushion in an HSA while you have coverage under an HDHP, and withdraw it at a later date to cover future medical expenses, even if you no longer have HDHP coverage at that point. So the takeaway point here is that if you have access to an HSA-qualified plan, enrolling in it and making contributions to the HSA will make it easier to deal with a potential future situation in which a hospital suddenly asks you to pay a significant chunk of money upfront before you can get medical care. If your employer offers an FSA, that's also a good option, but keep in mind that unused money in your HSA will remain in the account from one year to the next— that's not the case with FSA funds. Board of Governors of the Federal Reserve System. Press Release. Federal Reserve Board issues Report on the Economic Well-Being of U.S. Households. May 19, 2017. Kaiser Family Foundation. Employer Health Benefits, 2018 Annual Survey. October 3, 2018. United States Census Bureau. Health Insurance Coverage in the United States: 2016. September 12, 2017. And Health Insurance Coverage in the United States: 2017. September 2018. Internal Revenue Service. Revenue Procedure 2018-30.